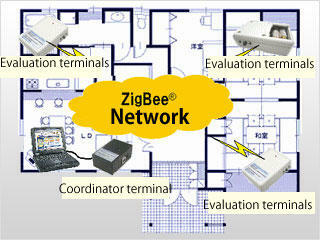 Evaluates the communication environment of ZigBee® in advance for smooth introduction. 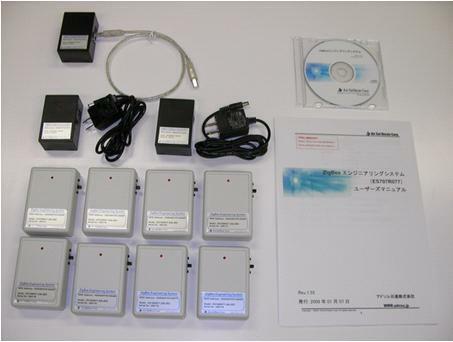 This system alone can evaluate the communication performance of ZigBee® at an actual site. Executes a communication test on the overall network at communication intervals, data length, and communication frequency suitable for an application (P2P test). Simulates evaluation of the application system. Evaluates reception sensitivity, error rate, throughput, and battery life through communication in the actual environment. Why is a wireless communication environment evaluation necessary? Wireless communication, such as with ZigBee®, is affected by external factors such as the environment. To prevent the problems of being unable to communicate when the system starts operating, it is very important to evaluate and check the communication environment in the actual location when the system is designed and created. Causes of problems can be predicted because evaluation is based on reception sensitivity, throughput, and error rate. Graphics: 1024 x 768 pixels min. Number of terminals connectable: 11 typ., 21 max. Major functions: Basic display function network configuration, reception sensitivity (LQI), throughput (Kbps), error rate (%), device type, transmission output (dBm), short address, IEEE extension address, battery life (battery-driven terminal only), etc. Graph display function: Graphs can also be displayed from a log file. * The contents of the package are subject to change without notice. (Note) License contract is necessary to use the software. This software product is protected by Japanese laws governing copyrights and incorporeal property rights. This software product requires permission for use by Ad-Sol Nissin Corporation. Ad-Sol Nissin permits the use of this software product provided it is used non-exclusively and it is not transferred to a third party. Ad-Sol Nissin not only develops ZigBee® systems but also offers communication environment evaluation tools necessary for actually using a ZigBee® system. By using these systems to evaluate the communication environment in advance, the cause of possible connection failures can be analyzed and corrective actions taken, so that communication problems that may occur after introduction of the system can be avoided.